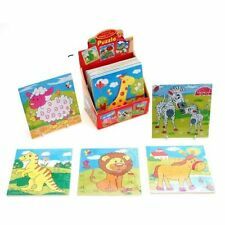 Educational,Puzzle,Magnetic Flags,Jigsaw Wooden Toys, Flags Book, Knowledge,Flag. 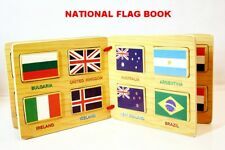 NATIONAL FLAG BOOK AS FOLLOW NEW ZEALAND. 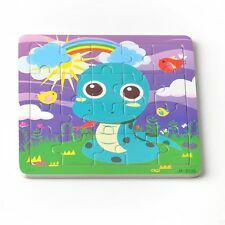 Each jigsaw contains 4 pieces. 4 hand crafted wooden jigsaws. 43cm x 27cm x 6mm Dice and counters included (not suitable for young children). High Quality Die-Cut Jigsaw Made with recycled cardboard Coated Both Sides Perfect for Children Easy to do, no instructions required. .
PADDINGTON BEAR 15 PIECE WOODEN JIGSAW HERE WE HAVE IS A COLLECTABLE VINTAGE 1980 PADDINGTON BEAR 15 PIECE WOODEN JIGSAW THIS JIGSAW IS USED HOWEVER IN A GOOD COMPLETE CONDITION FOR ITS AGE. PLEASE SEE ALL PICTURES PROVIDED ITEM WILL BE POSTED WITHIN 3 WORKING DAYS OF CLEARED PAYMENT VIA ROYSL MAIL 2ND CLASS POST PAYPAL ONLY WHY NOT TAKE A LOOK AT MY OTHER ITEMS THANKS FOR LOOKING! Vintage jigsaw puzzle. 20 thick wooden pieces. Animals playing football. Vintage animals playing football jigsaw puzzle. 20 thick wooden pieces . Size: 6" (15cm) high by 8" (20cm) wide. The puzzle is complete has no original box but a substituted box with a photo copy of the puzzle on the top of the box. 1 piece has been repaired with wood glue , please see our photographs. 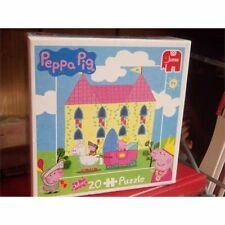 High Quality Die-Cut Jigsaw Made with recycled cardboard Easy to do, no instructions required. .
With three wooden 24 piece puzzles included in one set, hours of fun surely lie ahead. The durable pieces are the perfect size for little hands and fit neatly into one wood box for easy storage. Paw Patrol. Plastic Type:ABS. Size:About 21 18CM. Age Range:5-7 Years,> 3 years old. 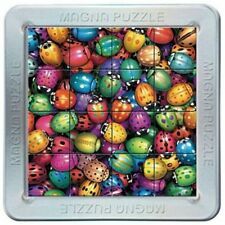 Fun educational puzzle,easy and safe for kids to play it by themselves(if they are too small need to be operated under the care of adults). HANDMADE FASCINATORS PLASTIC HAIRPIECES DIY ACCESSORY WAIST CHAINS MASKS KID TOYS BODY CHAINS BABY ACCESSORY. Creatures of the Reef. ANIMAL JIGSAW PUZZLES. A great way for your pre-schooler to discover animals and have fun! Safari Animals of Africa. Number of Pieces 15 - 25 Pieces. Be sure to add us to your. HANDMADE FASCINATORS PLASTIC HAIRPIECES DIY ACCESSORY WAIST CHAINS MASKS KID TOYS BODY CHAINS BABY ACCESSORY. Fit For 1-3 Years Baby. Your understanding will be highly appreciated! Size: Approx 15cm x 15cm.